I should be heaving on with another big chunk of work right now, but I need to decompress a bit and take stock – and ask some advice, too, if anyone doesn’t mind sharing. 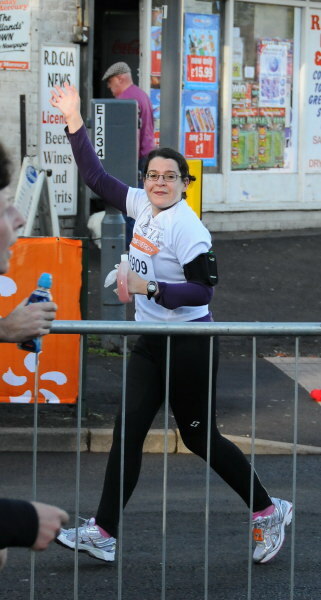 Oh, and this is a photo of me taken during the Birmingham Half-Marathon, 2010. 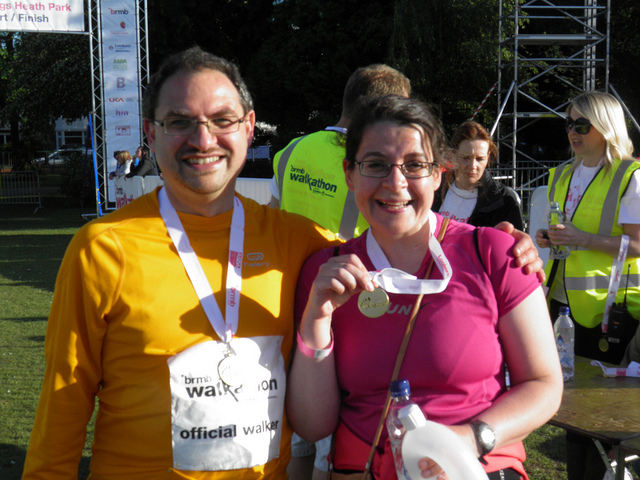 Half way round and looking cheery for the camera, but it was a big effort. I was better prepared last year, and it went a lot more smoothly. I need to learn from that. This is a bit of a rambly post which I have used to work things out in my head a bit. I would appreciate your advice and feedback, though, so do read on (there’s a nice bit at the end). So, Libro’s doing really well – too well, in a way. Yes, you can be doing too well. Not in that “I feel too well: oh, heck, I’m going to have a migraine” way, but in that “I actually have a little too much work to do right now” way. And I am organised. I have my famous Gantt chart, in which I book either regular work (like the Moseley B13 magazine that I know will come to me around the 14th of each month), my regular coaching clients who let me know their deadlines in advance, or work booked way in advance (usually student dissertations and theses). I also block in work I wasn’t expecting as it comes in to me, and I colour it in so when it’s in, it’s in red, I know I need to do it, but I have a visual reference of the work that’s in and when it’s due. 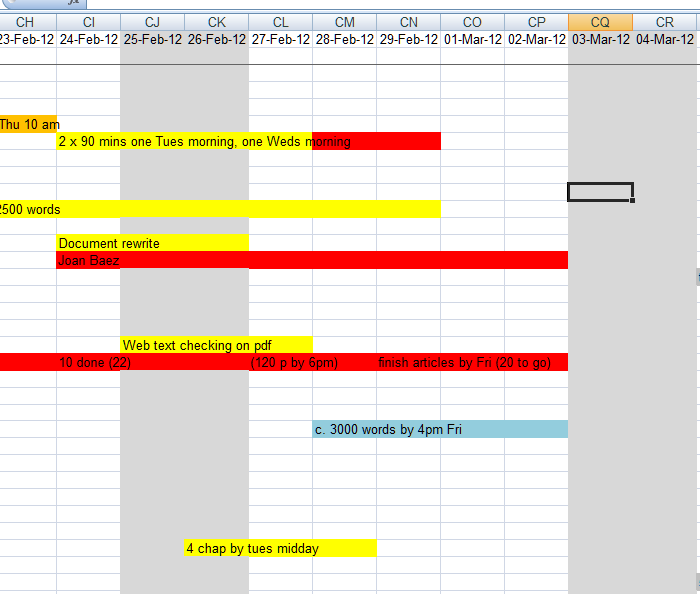 This is really helpful for knowing which order to do my work in and I can see my deadlines, the weekends, etc., at a glance. I would go badly wrong without this! Regulars who can send me big chunks of work, BUT I always have the option to say no. I can literally tell them what I can take and what I can’t. One of these is my big transcription client. I know when the next conference is, and I know that when that comes up I can look at what work I have booked in and say “I can take x hours of transcription to do by 9.00 tomorrow morning”. Similarly, I work for a student proofreading company. They get in touch to say they have x number of words to do, or they tell me when busy times are coming and I email in the morning and say “I can take 10,000 words today” and that’s fine. With both of these clients, I feel I can say no: they have a pool of other people who can work for them, too, so no guilt, no worry. Non-regulars who have booked in advance. If they know when their deadline is, they don’t usually need a mad and terrifying turnaround time, so I book them in with a nice big space so I know I have room to move them around if I have something urgent in (this is why I charge extra for urgent work for these people: if it’s urgent, it’s on a shorter time scale and I can’t move them). Non-regulars who haven’t booked in advance. If they are a potentially useful or interesting client who I can fit in now and would like to add to my roster, I agree and do the work. If I really cannot fit them in, or they don’t fit my skillset exactly, I have a group of trusted people I can refer them on to. If it’s a student dissertation, I’ll drop Linda a line. If it’s video transcription, off it goes to Michelle. Regulars whose work is always urgent. This is my tricky category (1). Let me state here and now that I like working with them. They have interesting work, they appreciate my hard work, and they pay on time: maybe all three! There are a few translators/translation agencies whose work is usually urgent, however it’s also usually short and doesn’t take too long. Then I have a couple of clients who send me larger projects. Quite often, this involves me dashing back home from a cafe or zipping upstairs from the sofa – or there’s an email to Matthew to say I won’t be around this evening … again. These clients don’t have another proof-reader / editor type person. I am the only one set up to help them. So, here’s my problem. I enjoy my work (on the whole). I am happy to work hard for my clients. I am happy to put in THE ODD 11 hour day for them. But I do not want to work all the hours there are and tire myself out. I don’t want to put back my gym trip or eat cereal at 2.30 pm for lunch. I do not want a chaotic day. I want to do the things I did this for: freedom to read, review, exercise, have my life back after working two jobs for a few years. What do I do? I am not prepared to employ people on an employed or contractual basis. There is not enough work all the time to do this, and the administrative burden is large. I’m going to write a “Where next?” post soon, but just assume I will not be taking anyone on permanently. Managing expectations is all very well, but these clients need the work quickly, and I can’t make infinite deadlines for my less urgent clients: their work has to be done at some time! I think I need to instigate a back-up plan. After all, I might get really poorly, or want to – shhh – go on HOLIDAY one day. I am not indispensable and I know that is a problem I have dragged with me from my employed life: I am good at what I do, and reliable, so an assumption builds that I have infinite capacity and can take on this, and this, and this … I am good at saying no to new clients, now, but I need to know how to work with current ones. First of all I need to source another couple of people I can refer on to. I could do with someone with good corporate experience, a marketing person who is also good at editing. I would prefer this to be someone I know, but if you know someone you can put in touch with me, great. This is NOT a job position or a guarantee I will send anything on. Also I would like to be able to avoid them poaching my good clients, although obviously if the client wants to move, that’s up to them. Then I need to arrange with my clients that we have a back-up person to cover me. I hopefully get first choice over if I can take the work: if I can’t, I will refer it on to a named, reliable, hand-picked partner. But then their relationship with my client is their own, they invoice them, and that’s that, nothing more to do with me, for that job. So this is similar to not taking on a job but recommending a friend, and in fact the transcription company now uses two other transcribers I have recommended, so I know that works OK.
Has anyone actually done this kind of thing? Does it work? Am I missing something here? Please share, either from a freelancer’s perspective or that of someone who uses freelancers. I would love to know how it works for you. I don’t want to let anyone down, but I also don’t want to let MYSELF down. Oh, and here’s a picture of Matthew, Tower of Strength to me. He has to ferry cups of tea upstairs and put up with me being “only half an hour late tonight!” to watch one telly programme before bed. He microwaves pre-made bean sauces for me (he hates beans) and doesn’t mind (too much) when I get behind with the housework I say I’ll do. This is a picture taken (by BRMB: thanks) at the Walkathon last year. He dragged me round, much as he drags me through some of these difficult days. Thank you, Matthew! I’m quite lucky in that I used to work as part of an extended network before I went freelance, with people who I know I can trust to deliver but also have enough specialism within the media training/crisis comms sector that they bring something else to the table as well – stops me thinking I can do it all myself! Sounds like you’re looking for more of a like-for-like fit to duplicate your own skills, but it still comes down to being able to trust the standard of work. Hope you manage to get something similar through social media channels. Thanks for your comment, Phil. I think building up my network of trusted people I can pass work on to but not lose clients to seems to be key – and also building up support networks on social media and perhaps also locally for that moan in the corner by the coffee machine we all need at one time or another! I do feel better having written it all out in the blog post, at least! I am getting to be in a similar position to you, with too many enquiries but not really wanting to turn anything down. I am starting the process by getting together a list of trusted bookkeepers and accountants I can refer work onto in a much similar way to yourself – although I would like to get a system going where I take the work in but sub contract to others. I have set up a link with a freelance virtual office administrator to help with admin tasks when I am booked out too many hours to keep on top of them. There is no promise of work there – she just invoices me for work done – the first session involved teaching her my database and system though. I may have some people I have met through networking I can put you in touch with as backup support – I will take a look and send you some details. Thanks Aly – and yes, that would be useful to have some referrals. I am OK with my own admin as that’s not too onerous, and the new clients are OK as I am fine moving them on!! but it’s what to do with the ones I have already that’s more tricky. Any ideas on that one? Put your rates up! I am quoting higher rates to new clients – less might sign up but you earn more with the ones you do! Well, I put my rates up for everyone at the start of this year, so that’s all good, but it’s the current client issue I need to sort out .. I seem quite good at saying no to new ones unless they really fit my portfolio and seem like good clients to have … But that is a good point, of course! I agree with Aly, put your rates up! If you complete one job for a client at one rate, and then they come and ask you to do a new project, it is perfectly normal to tell them that you have now increased your rates, and that you can’t justify doing any new work at the old rate. As someone who has used your services before, but hasn’t been in touch with any new work for nearly 12 months, I would certainly expect the rates to have changed. Having said this, I do also think that in-kind/mutually beneficial relationships can work too, without any cash changing hands, as long as both sides know what they are committing to. Thanks for your comments, Paula. Re prices, I put my prices for all my clients (under consultation with them) up at the beginnning of the year. The regulars I have send me work almost every day so I can’t put prices up constantly – nor would I want to lose them. The issue is more that I need to work out how to arrange back up for when I can’t fit in all the jobs. Oh – and on pricing, some of my jobs are on a fixed price stated by the clients which are not up for negotiation (they are typically middle-people between me and the eventual client, if you see what I mean). So pricing is sorted out as much as it can be, new clients went on the new pricing before the regulars did and some of them have special offers, but the pricing I offer now matches industry standards (which it didn’t do before really). Hi there – I’m Sarah Rennie’s friend and own a Virtual PA/Marketing business. I am exactly the same as you…work all hours, never have a holiday, addicted to my laptop and blackberry and don’t often come up for air! I do outsource though..to ladies on a self employed basis. I give them clients to work for and they have their own email address. If work goes quiet, I can always take them back and this is the start of growing a business. I have a contract with them to stop any client poaching, although I know them well enough (hopefully! ), to know that they won’t do that. I’d be happy to meet up for a coffee and a chat to see if we’ve all got “stuff” to pass amongst ourselves or at least cover for each other if we ever go on holiday!!!! Hello Jude and thanks so much for your reply. Yes, I’d love to meet up and discuss how we could possibly provide some cover for one another. I am trying NOT to be “that person” after having done the corporate career thing and spent a couple of years juggling day job and Libro, but it’s time to work out how to do this (with my clients on board, of course!). Let’s sort something out soon – I’ll drop you a line! Loved the photos – almost like being there. Almost. I enjoyed the description of your way of handling the work load and breathed a sigh of relief that it is you not me even though some days my unread emails give me similar feelings. Mercifully not at the level they need charting. Gone are those days. May I suggest that you do reconsider the question of keeping on at the old rate for the older less regular clients. Prices increase and they would surely know that. Thank you for your comments, Jan. In each of these cases, it seems a bit wrong to suddenly whack up their prices. And in other cases of non-students returning to me, I have told them of the new pricing and that has been fine. Liz, your heavy workload these days sounds a lot like mine. I have taken to referring clients to trusted colleagues. Most of the clients come back to me, and many use both my services and those of the referred colleague. It works well for me. I’ve read that some editorial professionals ask for a referral fee from colleagues they send work to, but I’ve never done that and don’t intend to. The goodwill of grateful clients and colleagues, along with knowing that I have lots of capable backup, is enough payment for me. Thanks for your comments, Katharine, and it’s great to know that it is indeed possible to do this. Well, I have referred new clients over to trusted colleagues and I don’t think we are really in the habit of poaching each other’s clients! I don’t like the idea of referral fees, either, for what it’s worth. I am glad I wrote and published this post and I can see you having the lifestyle I would like for myself, so that’s really encouraging – I will continue to watch and learn! Unfortunately, in our business it’s a case of just turning down the work, or quoting very high in the hopes that you don’t get it. We had the contract for the Olympics….but couldn’t cope with it, we were letting all our other customers down (some who’ve been loyal for years). So we started saying no to jobs and in the end they went somewhere else. I wish I could be more helpful, so all I’d say is please don’t let it take over your life. Thank you – it is good to know people are thinking of me. I am determined to not let it do this to me, or at least not more than one day a week, say. I think it’s just a settling in process. Once I have sorted out back-up, and thanks to writing this I seem to have a few leads on doing that, I think it will become easier. I certainly don’t take on every job I’m offered now! Really impressed by the professionalism of your business, Liz, hope you continue to do well. Thanks, Jon – I really appreciate your comment!